To Mid Nov-13 there looks to be approx $30m finance committed to companies with a market cap of approx $100m (see spreadsheet at bottom of page). Pinetree's market cap at the same point is $48m so this fund, which will be a London listed Investment trust, will be a significant size for the nano/micro-cap sector. Pinetree see a stock price of 32c vs NAV at 77c, a big discount. GRIL has been established to exploit investment opportunities in the junior mining and natural resource sectors worldwide, with an investment objective to generate medium and long-term capital growth. GRIL will re-register as a public company and be constituted as an investment trust with the name Global Resources Investment Trust Plc ("GRIT") and seek admission of its ordinary shares on the main market for listed securities on the London Stock Exchange. The Investment trust has yet to list on the LSE ? - I cannot see anything on Trustnet or Google finance. Listed - performance and monthly reports. - monthly newsletter. The commitments of share exchanges will clearly depend on a liquid market for the investment trust. The fund was announced back in January 2013 with a £50k minimum investment level. I am unsure whether this has allowed early investors to build the fund which will then float or whether there is no finance in place until float. The delay in making investments has either been very smart as prices continued to fall during 2013, or reflects how far out of favour natural resources have fallen. Clearly prices may continue to fall but looking through the watchlist below there are some extremely low market caps to make a return on, if the companies can remain solvent to progress. The launch also refers to an activist investment mandate. (though the article by Albert Matter below may question this). Our funds hold large stakes in portfolio companies and RDP actively manages these holdings. This means regular contact with the management of investee companies and advising them in areas where they may have less expertise. RDP will push for companies to always make decisions in the best interests of shareholders, rather than management. Our fund’s large holdings in these companies will give us the leverage we need to push for positive change. Here Albert Matter discusses GRIT from Nulegacy's perspective as an investee - the financing benefit will obviously depend very much on the market for the London listed investment trust over time. The stock swap can sometimes avoids warrants (though a number include them) but the investment trust discount vs book value and pricing at the point companies choose to sell, and their urgency to sell GRIT stock will be key. There must be a danger that the continued selling pressure from investees will extend the discount, presumably GRIT will try to manage this securing institutional investors to buy from the investee companies? A number of the companies do appear interesting, though the payment of some finders fees makes one wonder how much the trust are finding or being pointed to opportunities, Jordan Capital Markets looks to earn a number of the finders fees. Success will clearly depend on the quality of due diligence processes. Some of the principals look to have been involved at Grafton Resource Investments and previously at Resources Investment Trust. Merfyn Roberts is at Agnico Eagle? Miles Thompson is at Lara Exploration, one of the Prospect Generators followed by Brent Cook and was previously at Reservoir Capital. Siberian Goldfields - From the Grafton Resources Portfolio ? Cornerstone Metals (CCC.v) (formerly Appleton Exploration) - Website - 4 Copper projects 2 near Freeport McMoran. Nitinat Minerals (NZZ.v) - Website - Cu/Zn/Ag - BC Canada ? Pertroleum Russia? Cornerstone Metals, Valterra, Homestake Resources, Tirex Resources. He is associated with the Manex Group. What GRIT are doing is one example of institutional money looking for value in the very junior sector. Lawrence Roulston has this to say. Investors are slowly returning to the resource markets. The metal prices are generally recovering from their lows and share prices for many companies appear to have bottomed. Further, the global economic outlook is improving. Government stimulus programs across the developed world are creating concerns for the long term value of currencies, and making precious metals and other hard assets look attractive. While the worst may be over for resource companies, it may be some time yet before there is a broad recovery in the markets. At this moment, the markets are in the hands of a few investors -- those most familiar with the cycles in the resource markets. While those knowledgeable investors are accumulating positions in the best quality companies, other investors are still on the sidelines. The markets are poised for a rebound from a severely oversold position, but most investors are unwilling at this time to put money into the resource markets. 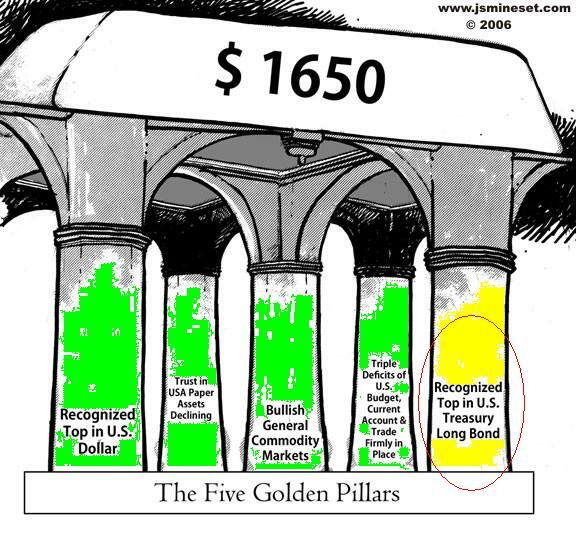 As in every market cycle, money will flow into the markets after the uptrend is well established. By then, the best companies will already have posted big gains. Investors entering the market late will pay higher prices for the good companies, or will get the lower quality companies at (deservedly) low prices. Finding the right stocks early is not so easy but the watchlist below shows that many stocks are well above 52 week lows. A final plunge in gold could change this. The CDNX venture index is on the brink of support but it is likely that the index will continue to be dragged down by the unfunded dead and dying long after better companies make a turn. Basically The GRIT shares have been intentionally lowered to entice investor participation on the backs of POG and silver moving up as well as discount applied to mining companies' NAV making up the GRIT portfolio. 1 pound/share opening price for GRIT shares seem to be very cheap and as long as precious metals move up it should also move up quite nicely.